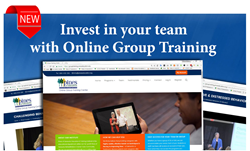 Pines of Sarasota Education & Training Institute just launched its brand new “Online Group Training Center,” located at https://grouptraining.pineseducation.org/. Pines of Sarasota Education & Training Institute just launched its brand new “Online Group Training Center”, located at https://grouptraining.pineseducation.org/. This website enables healthcare facilities, universities, and any other large groups to offer individual viewers access to programs by Teepa Snow and other senior care presenters around the clock, 365 days a year. For staff training, a “Group Leader” can be chosen to monitor students’ progress and quiz results. For more information about the seminars please visit https://grouptraining.pineseducation.org/ or call (941) 309-5750. Pines of Sarasota Education & Training Institute is the educational department of not-for-profit Pines of Sarasota Rehabilitation and Senior Care Community, providing cutting-edge, specialized education, outreach programs, support, and resources to family members and geriatric caregivers. For more information visit http://www.pineseducation.org. Pines of Sarasota Rehabilitation and Senior Care Community provides excellent and compassionate inpatient/outpatient rehabilitation services, skilled nursing, memory care, assisted living as well as educational programs for seniors and their families in order to help enhance their quality of life. Pines of Sarasota Rehabilitation and Senior Care Community epitomizes innovative initiatives including; an on-campus child care and learning center which fosters intergenerational interaction and learning; Falls Prevention Programs which help minimize the risk of falling and; a comprehensive Volunteer Program that supports every aspect of campus life. Pines of Sarasota Rehabilitation and Senior Care Community is a not-for-profit organization that leads the way in holistic senior care. For more information please visit http://www.pinesofsarasota.org.